This Disney Couture de Force Maleficent Figurine is a must buy for fans of this fascinating villain. This very collectible Maleficent figurine statue is full of excellent detail. If you are a Maleficent fan you have to have this on your display shelf of Disney Enesco collectibles. ever since we first saw it displayed. However, we had resolved to put it on our Christmas wish list. we just couldn’t help ourselves though! The Maleficent Couture de Force figurine is really detailed. Often at that price point, you really sacrifice the detail, but that isn’t the case with this beautiful Maleficent figurine statue. For the price, we think that the detail is amazing and way more than you would expect. Everything is hand painted. You can even see her red nail polish in detail! The Disney Couture de Force Maleficent Figurine is one of those really difficult characters to get right for some reason. 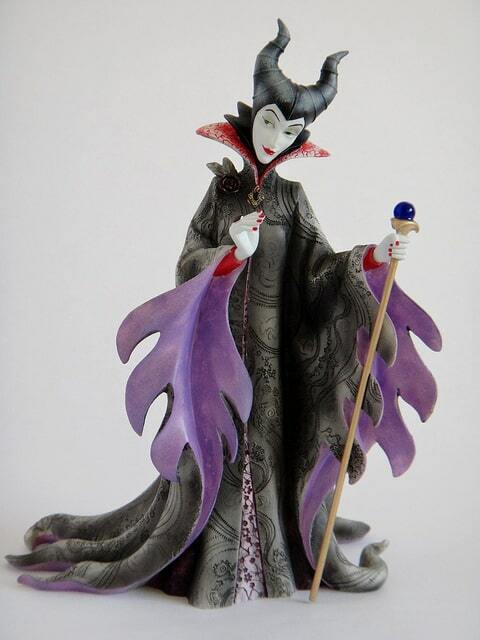 Die-hard Maleficent fans (yes we count ourselves in that category) can find it hard to find a figurine that they like. This one caught our eye from the very start as, although the face is a little less “evil” looking than some, it pretty much gets it right. We are also very tempted by this Enesco Disney Showcase Cruella Couture de Force Figurine. Again, the detail is excellent. If you love Disney villain figurines and are looking for the next one for your collection we know you will be tempted by this too. This is priced slightly higher than Maleficent but is still way cheaper than the other stores that we have seen where it sells for a much higher price. Grab this one while you can. All of the Disney Enesco Disney Showcase Cruella Couture de Force Figurines are around 8 inches tall. The perfect size so that you can see the detail – and they look amazing in your Disney collectors display.